Fellow space explorers, unfortunately, we had to cancel our upcoming Mad Libs Story Battle scheduled for this upcoming Thursday. We’re sorry to anyone who was looking forward to the event. But if you’d still like to show your love to Story Planet, it’s never too late to donate online to support our awesome after-school programming that’s FREE to students or, better yet, sign up for one of our workshops! As well, on June 18, we’ll be hosting our first ever Open House! Come by for an amazing silent auction, free wine, beer and nibbles and some great entertainment. Drop in for a bit, stay for a while! We’ll announce more about this event soon! 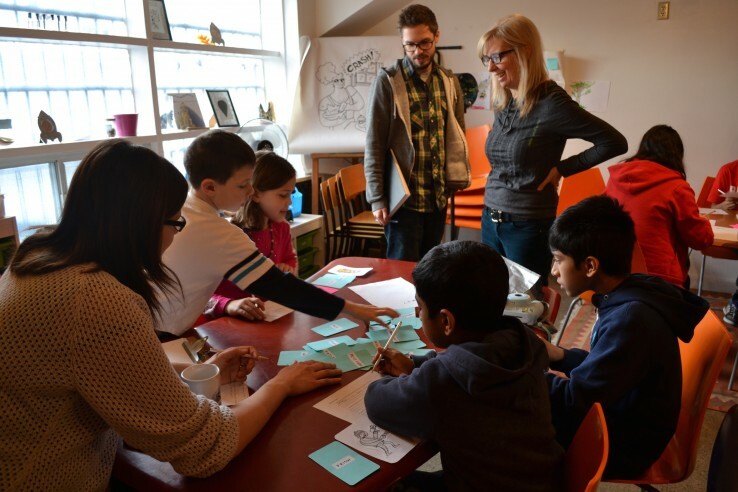 We’re hosting another Storymaking App Workshop this weekend! Students aged 7-11 are invited to join us on Saturday, May 30 from 10:30am-12pm to join the team and design a storytelling app made by kids for kids! This first session will be a brainstorming and ‘trying apps’ one. More workshops are schedule for when we’ll dig into design, coding and prototyping! The registration cost of this workshop is pay what you can. If you were at our last app workshop, you’re welcome to come to this one too! Teens: Feeling overwhelmed about school? Life? We can help! Sign up for our Teen Stress Buster workshop led by Rachael Frankford, MSW, RSW, Social Worker and mindfulness/yoga teacher and learn the skill you need to keep calm and write your exams with confidence! The workshop will be held in our space this Sunday, May 31 from 10:30am-12pm and then again on Sunday, June 7 from 10:30-12pm. The cost of the event is $20. For more information or to register, contact Liz at liz@storyplanet.ca. Are you writing a book? Are you confident in the first page of your manuscript? If so, bring it with you to our next Write Space Workshop with Joseph Kertes on Thursday, June 4 and present it to the rest of the workshop class. The other writers at the table will act as editors, telling you what works, what doesn’t, and whether they felt compelled to flip to page 2. Each seat at the writer’s table costs $50. Follow this link to find out more about the workshop and reserve your spot! High school students, are you ready for exam season? On Sunday, May 31 and Sunday, June 7, you’re invited to join Rachael Frankford, MSW, RSW, Social Worker and mindfulness/yoga teacher for a Teen Stress Buster workshop that’ll give you the tools you need to manage your stress during exam season. Good luck in the coming weeks, students! This Thursday, Author Vikki VanSickle will start off our next Write Space Series with a discussion about the ever-intimidating publishing process. She’ll talk about what to expect when finding an agent, working with an editor, promoting your own work and more. Vikki’s workshop will take place in our space on Thursday from 6:30-9pm. Each seat at the writer’s table costs $50. Follow this link to find out more about the workshop and reserve your spot! The TIFF Next Wave Committee is a group of students between the ages of 15 and 18 who live in the GTA and share a passion for film. While the Committee members all have different tastes, opinions and plans for their future careers, they’ve all demonstrated an enthusiasm that has impressed TIFF leaders. With the guidance of TIFF employees, the Committee gets to plan some of the major teen-oriented events at TIFF Bell Lightbox, including the TIFF Next Wave Film Festival. If you’d like to join the TIFF Next Wave Committee, follow this link to find out how to apply! The TIFF Next Wave Committee is supported by The Slaight Family Foundation Learning Fund. We still have tickets available for our Mad Libs Story Battle fundraiser! Our theme for this year’s event is “Eat, Drink, and be Mad.” The evening will include delicious treats, drinks and a panel of celebrity chefs/authors to help crown the 2015 winning Mad Libs team. All proceeds from this event will go toward funding Story Planet’s unique writing and arts programming for kids and teens. Click this link to get your tickets before all the seats have been filled! We’re working on a new storymaking app and we need your input! Kids between the ages of 7 and 11 are invited to join us on Saturday, May 30 (from 10:30am-12pm) to help us design a storytelling app that’ll help kids like them create and share their stories. The registration cost of this workshop is pay what you can. Contact Liz at liz@storyplanet.ca for more information or to sign up. If you’ve come to one of our past app making workshops, we’d love your input on this one too! Stargazers, have you bought your tickets for our Mad Libs Story Battle fundraiser yet? Our theme for this year’s event is “Eat, Drink, and be Mad” and it will of course include delicious treats, drinks and a panel of celebrity chefs/authors to help crown the 2015 winning Mad Libs team. All proceeds from this event will go toward funding Story Planet’s unique writing and arts programming for kids and teens. Click this link to get your tickets before they sell out! High school students, are you struggling with your final essay? Sign up for our workshop next Saturday, and receive FREE one-on-one help, lunch and a tour of the University of Toronto campus! The workshop will take place from 10 am – 12 pm (the tour of the university will be after the workshop) at the Multi-Faith Building (569 Spadina Ave.) at the University of Toronto. Space for our FREE Essay Help Workshop is limited. Contact Joe at joe@storyplanet.ca or call (416)645-1049 with your name, what grade you’re in and which class your essay is for by Thursday, May 21 to sign up. Author Vikki VanSickle will be kicking off our next Write Space series with a discussion about the ever-intimidating publishing process. She’ll give tips on how to find an agent, work with an editor, promote your project and tell you what to expect in the Canadian market. Each seat at our writer’s table costs $50. Click here to sign up while there’s still space available! 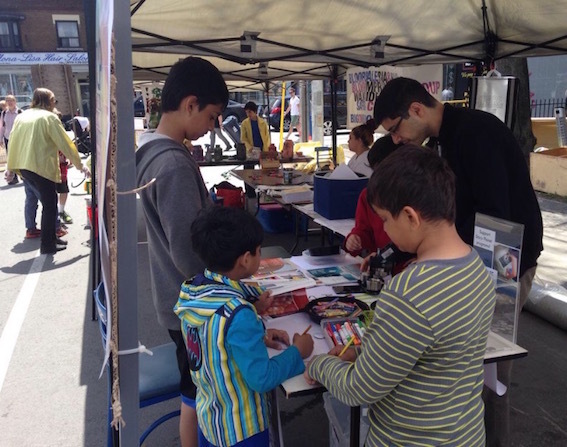 Fellow earthlings and volunteers, thank you to everyone who participated in our button-making fun during the Bloordale Spring Fest! We had an absolute blast! If you missed this event and would like to take part in the next one, keep checking back to our blog and our events page on our website to find out what’s going on! Fellow readers, it’s that time again! Tomorrow night at 6:30 our Afterlight Book Club will be meeting to discuss The Massey Murder by Charlotte Gray. This event is open to everyone. RSVP on our Meetup event page to let us know you’re coming! Are you writing a book and wondering how to approach editors, agents and publishers? Vikki VanSickle, author of the critically acclaimed Clarissa book series for kids will be hosting the first workshop in our next Write Space series. She will discuss everything you need to know about the publishing process from how to find an agent, to working with an editor, self-promotion and what to expect in the Canadian market. We’re hosting a FREE Essay Help Workshop on Saturday, May 23, for high school students who need help with their year-end assignments. Each student will get one-on-one help with their assignments, lunch and a tour of the University of Toronto. All for no cost! The workshop will take place from 10am – 12 pm (the tour of the university will be after the workshop) at the Multi-Faith Building (569 Spadina Ave.) at the University of Toronto. Good luck with your year-end assignments!